Hope the chicken feet won’t scare you off. As a matter of fact, this soup is very tasty, as a result it earned its popularity in Chinese community. This soup is put on high priority on my menu as my family loves it so much. When I first moved into Australia, I could ask for chicken feet for free from supermarkets because most Australian didn’t like chicken feet. So the staff would throw them away. They’re so glad that if you asked and would give you a large packet. Now a small amount of chicken feet costs quite expensive instead. When papaya is unripe, its flesh contains higher density of papain, an enzyme that helps digest proteins. Sometimes I like to use a slightly ripe papaya with a firm touch, as its orange flesh taste sweeter. Either unripe or ripe papaya, yet not too ripe, is good for making this soup. 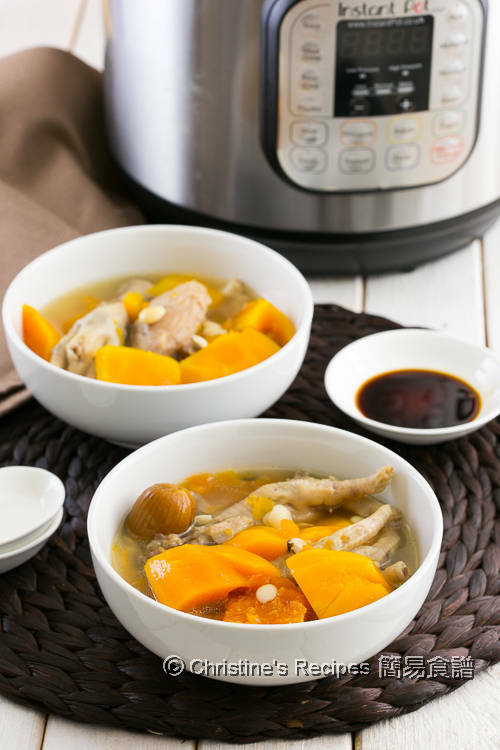 With my Instant Pot, I can make this papaya and chicken feet soup in a significantly shorter cooking time, compared to cooking on stove traditionally. 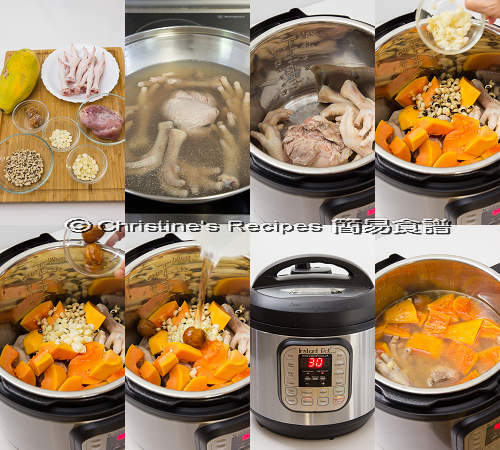 The soup will taste equally good no matter you use an Instant Pot or cook it on stove. The other thing I like using Instant Pot is that I can easily predict how many water I need to cook with, simply because it’s not too many water will be boiled away. The soup tastes and looks exactly the same as my mother-in-law’s long boiled one. Peel papaya and deseed. Cut into chunks. Rinse all other ingredients. Set aside. Cut away the toenail part. Remove the callous and any loose-hanging skin. Rinse chicken feet. Blanch in boiling water with pork shin to remove any blood or impurities. Drain well. Set aside. Put all the ingredients in Instant Pot. Cover the lid and turn the pressure handle to “sealing” position. Press “soup” button and cook for 30 minutes. Run quick release. When the valve drops, remove the lid. Select “saute” and cook for 10 minutes. Season with salt. Serve hot. Enjoy! 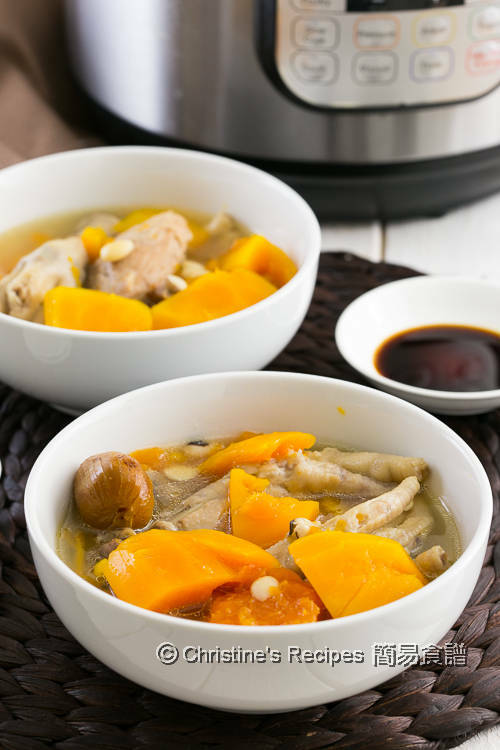 Follow the above mentioned instructions and prepare papaya, chicken feet and remaining ingredients. Put all the ingredients in a large deep pot. Pour in 7½ to 8 cups of water. Bring it to a boil over high heat. Reduce heat and simmer over medium-low heat for 1½ to 2 hours. Season with salt. Serve hot. After high pressure cooking has finished, use “saute” to cook for 10 minutes or so if you want it look like traditional Chinese long boiled soup (老火湯). The taste will be more intensified with a cloudy presentation. I often use red papaya which has orange/red flesh and tastes sweeter than pawpaw. Chicken feet are available at Asian butcher shops. You might use iither fresh or frozen ones. I have never seen the supermarkets over here selling chicken feet..the soup looks really tasty! Happy New Year!